Our second demonstration comes from Elissa Robinson. She’s going to talk to us about her first year teaching ESOL in the United States. Elissa taught for three years in Japan before coming back to the states last year. 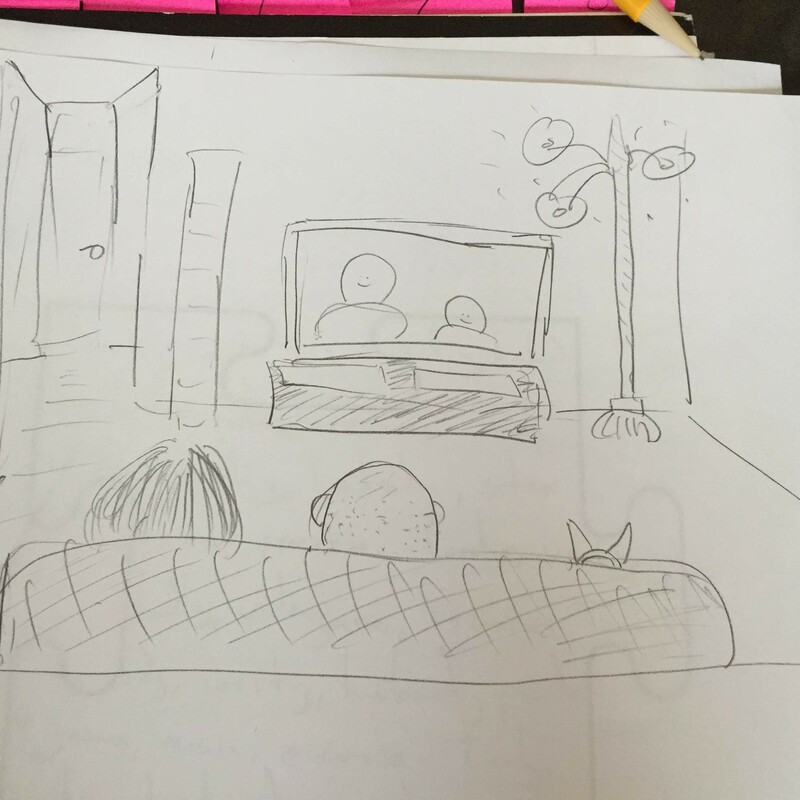 Quickwrite: What do you think of when you hear ESOL (ELL, ESL)? Put ESOL in the middle of your paper and make a web to show your thoughts. Elissa talks us through her personal background and how she got into teaching. She has a fascinating story that gets to the U.S. by way of teaching English as a Foreign Language (EFOL) in Japan. Teaching English Language Learners (ELLs) presents a wide array of challenges. Many of us take for granted the fact that the children we teach (especially by middle school where I teach) are already fairly socialized into the social order. Many ELLs come to us from different cultures with drastically different norms. They have to take many mandated computer exams (confusing for students who don’t know what a computer is). Elissa speaks to us in Japanese for a couple minutes. Although she tosses in a few English words, we have absolutely no idea what she’s talking about. And then she asks us to reflect on how we felt. The stipulation is that we can only use 1-2 syllable words. This activity is probably designed to give us a taste of what it’s like to sit in a classroom where someone speaks at you in a language you can’t understand. Oh wait, this is supposed to be 1-2 syllable words. I felt bored. Fun at first, but that fast turned into being confused. I had no clue what to say or what she wanted me to do. It was easy to tune out. It made me think about my own use of language in class, both I say and how I say it. Elissa says she saw many familiar faces from her ELL classes in the room. Some of us were on the edge of our seat, eagerly trying to tease out what she was saying. Others sat dumbfounded and slackjawed (I fall into the category). And some just glazed over. We share out how we felt and the consensus seems to be confused, lost, and rendered mute by the maze of language. The purpose, she says, was to put us in the mindset of her students. Teaching writing to a population with this unique set of capabilities presents a number of challenges. The room erupts. Everyone here has powerful experiences working with ELL populations. Our stories are never about the children; they’re all about the policies and practices used by schools and districts. Immersion, mainstreaming, push in/push out, accountability testing, etc. Elissa says she’s going to share with us a few different activities she uses in her class. The first is called “What’s Next Writing.” Elissa passes a bag around. The bag contains lots of small tiles with pictures. We all take a single tile and then proceed to create a chain of associations. I have a picture of a waterfall. I see a waterfall. Waterfalls are out in nature. I’m not that big a fan of nature. My wife loves nature. She is short and squat like me. I’m 5’7, which is an inch below average height. Students love comparing heights. The Heights was a terrible TV show in the 90s. I was an adolescent during the 90s. That makes me a cusper between Gen X and Millennials. I always forget that millennium has two Ms. Remember that show Millennium with Bishop from the movie Aliens? I blame watching Aliens 500 times as a child on my intense fear of spiders. Writing this was an interesting experience. It felt like I was taking the constraints off of my ADHD. I had to consciously make sure I didn’t go in-depth with any of the sentences. I wonder about this type of writing. I seem to be forcing/creating connections between various schemata. How does this type of writing function with the brain-based cliche of ‘what fires together wires together’? We love these, btw. The progression of writing from the beginning of the year to the end is just amazing. Students can have dialogue buddies and respond to one person back and forth throughout the quarter. They can go with parents, etc. Many options. Elissa tells us how the journals become a safe space for the students to reflect. The last thing she has us do is create a Facebook profile for a character from history or literature. It also works for concepts. The applications are numerous. You have to add writings on the wall from others, monologues, relationship status, likes, friends, and etc. Although Elissa gives us a handout with the template on it, you can also do it online using the free website Fakebook. We’ve done this with Tweets as well. We’re running out of time, so Elissa wraps up her presentation with This lesson reminds me that “best practices” aren’t always that. Phrases like “good teaching is good teaching” mask the fact that students are always in different developmental places. That said, there are some tips: speak slowly, use multiple checks for comprehension (asking ‘what are your questions?’ instead of ‘do you have any questions?’), and more. What a great presentation! Heather Jung, a Teacher Consultant through the NVWP, begins with an introduction about herself and what she’s been up to since she attended last year’s ISI. She’s given in-service demonstrations and presentations for various counties and conferences. She’s here today as part of one of our four interest groups. Each interest group is tasked with investigating and reporting on the state of writing with regards to the group’s focus. To the best of my knowledge, this is the first interest group focus in years. The second member, Heather Grant, provides a similar introduction with personal updates. The Writing Project is like the best club ever. Heather Jung runs us through a mini demo-lesson: Multimodal Literacy: Good ELL Instruction is Good Instruction. Multimodal literacy refers to making meaning through the reading, viewing, responding to, and producing with multimedia and digital texts. Heather says that MML incorporates all of the aspects of literacy: reading, writing, speaking, and listening. We should care about MML because the traditional ways to acquire literacy skills are shifting from primarily page-based to screen-based. Foundational skills must not be lost in this shift to screen-based literacy. I’m reminded of the digital native discussion. We cannot take for granted that students are automatically familiar with technology because of their generation. Critical literacy lives within every genre and mode of media. Quickwrite: What do you value in literacy instruction? What a question! This leads directly into my own presentation (which happens to follow this one). Although literacy is in many ways a simple thing (decoding and pulling meaning from words on a page and making meaning by producing words on a page) But as soon as we begin to tease out the intersections of power inherent in both reading(reading what? are we reading for the narrative or against the narrative? Who gets exposed to which literary genres?) and writing (Who is writing? What are they allowed to write? Who has access to the rules of power characterizing academic discourse?) Ran out of time! How do I teach multimodal literacy? If you understand literacy instruction than you understand multimodal literacy. In terms of technology, work within your own Zone of Proximal Development. Students can develop literacy skills through digital social interaction (constructivism). A good way to think about teaching multimodal instruction is as adding a range of experiences and genres vs. whole-scale replacement. Digital texts provide many rich opportunities for rhetorical analysis: analysis of audience, genre, and purpose. We can submit every feature of a digital artifact to close study just like a more traditional print book. Heather Grant now begins her mini demo-lesson on using poetry with ELLs. She opens with an intense poem she wrote from the point of view of an English Language Learner (specifically a child from Afghanistan). It helps remind us of the way language bombards and hammers children from the instant they step into a school. Learning a language isn’t linear; it arrives in waves. Academic language often takes five to seven years, sometimes longer, depending on the student. Writing in a second language is intimidating. Teachers can make faulty assumptions about a student’s ability to read and write based on the child’s oral language (which is acquired quicker). Heather says that writing poetry can build a bridge between the spoken word and written word for our English learners. Listening to poetry helps us develop an ear for the cadences and rhythm of a culture and its language. Poetry is first an oral tradition and, like music, doesn’t necessarily need to be fully understood to be enjoyed. The play aspect of poetry makes for a friendlier entrance point into literacy. Using only a few words to describe complex things can make writing enjoyable and build confidence. It also values personal voice, experience, and culture. Creating and sharing poems can help students not only express their heritage but it also builds cultural awareness among students of all backgrounds. As an added bonus, poetry allows a teacher to cover a wide range of state and ESOL standards. Sorry about the shoddy image quality, today! Heather offers us a quick flurry of poetry lesson ideas. I’m not going to type them out because there’s too much to convey in the moment. She discusses breaking apart mentor poems, studying them, emulating them, publishing them, etc. Listen to multiple readings of poems. Read it out loud with expression. Push students to respond with the heart and the gut before they begin analyzing. One of my favorite tips is to allow students to intermix their home language with English when they write. This lesson is based on the book What You Know First by Patricia MacLachlan. It’s about the connection to your original homes after you leave it. It gives ELL students, presumably mostly immigrants, a chance to acknowledge the pain of leaving a first home. 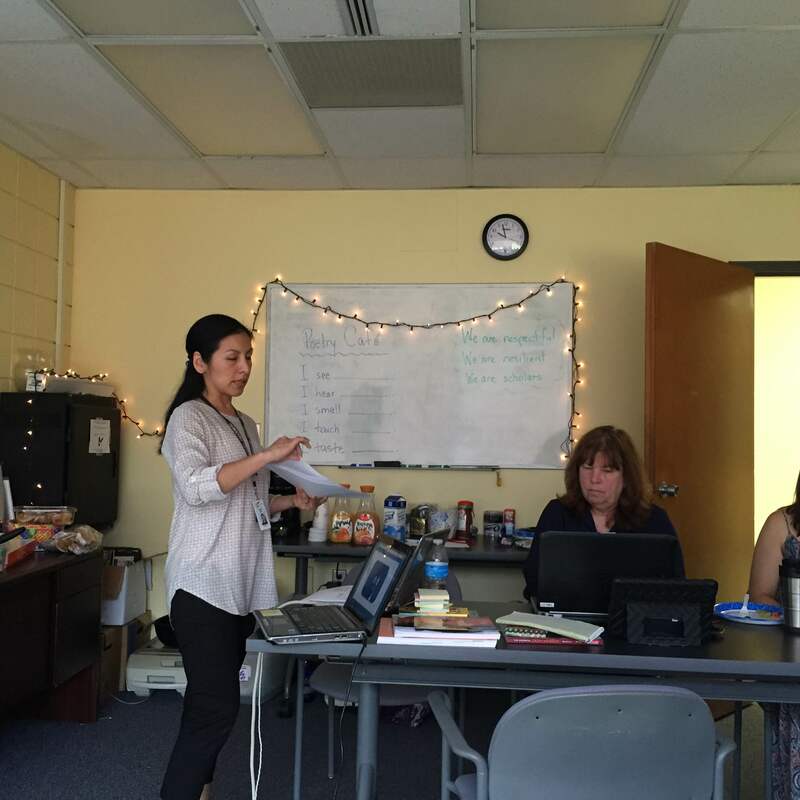 Amy works with many ELL and ESOL students who have changed their living contexts within their memorable lifetime. This lesson helps them tap into the power of place. The power of a place we no longer call home. Before she reads us the story, she has us complete three writings about what we knew first. Use the 5 senses to talk about my first important place (ties in with setting). Next, Amy has us write about the people in that place (ties in with characters). Physical or personality descriptions. Important memories, etc. Family is complex. Let’s do some description work. My love of ascetic routines comes from pops. My mental image of my father shows him wearing the khaki chinos and blue button-down shirt he seemed to sleep in. Sitting in his study reading or writing. Probably smoking. Lastly, what happened when you left that place (ties in with plot)? What happened in the multiple instances of leaving? 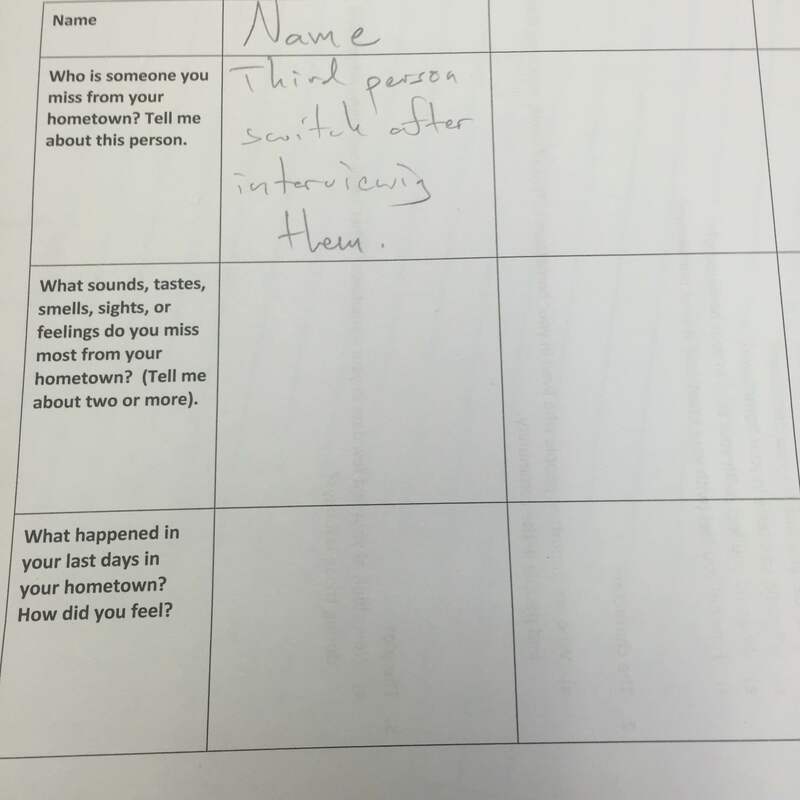 Amy uses Conversation Grids with ELL students to help connect written and spoken words, generate language around an idea, practice third person singular, and build a sense of community (phew!). We walk around and interview each other. Again, as I write every day, the act of using language and literacy in a social setting is magical. Breaking down the barriers between children that a society steeped in competition and atomization inserts between us. Next, Amy does a read aloud of What You Know First. She sets our reading purpose: what will she miss and how does she comfort herself? She mentions some of the many reasons to do read alouds. She talks about stop and jots (stopping reading to ask comprehension questions of the audience), a practice I agreed with until hearing Ralph Fletcher denounce it at a conference. He said it was akin to someone leaning over and talking to you constantly during an exciting movie. However, she stops and explains many words and concepts from the book that might confuse ELL’s. This definitely speaks to the importance of context in reading comprehension. Obvious tie-ins with reasons why many children struggle with standardized tests. This activity brings out a lot of deep stuff for us. Some of us who have mined our past before are well-equipped to answer these questions and talk about our pasts. Others might have only begun the process. Either way, the self is a seemingly infinite pool of material. Fantastic week! Be back on Monday. Our first presentation is Gabby Rivas. 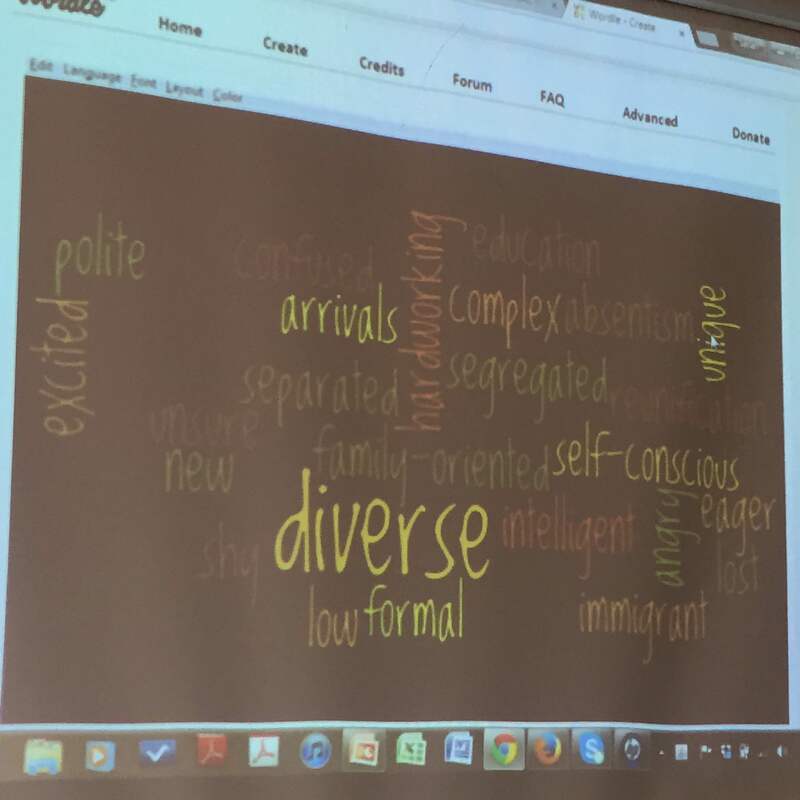 She begins by asking us what words and phrases come to mind when we think about ESOL students. Then, she puts it into a Wordle. Her job is to target listening, speaking, and writing as soon as she can. She gets one year where they’re exempt from their Reading SOL. Her one year to get everyone as ready as possible for the world of high-stakes testing. She needs to make sure everyone feels safe and sheltered. Increase the dopamine and decrease the cortisol levels. Get the learning going in the hippocampus and get reasoning and critical thinking going in the frontal cortex. She then has us complete a puzzle piece. While doing this, she plays Debussy to get us (and her students) familiar with aspects of Western Civilization. I’m reminded of the humanist movement of education dating to the early and mid-1800s. This strain of humanism imagined education to be a civilizing force of acculturating. A way to inculcate a sense of Western tradition and classicism in both native born students and the many immigrants increasing in volume exponentially during the mid to late 1800s. 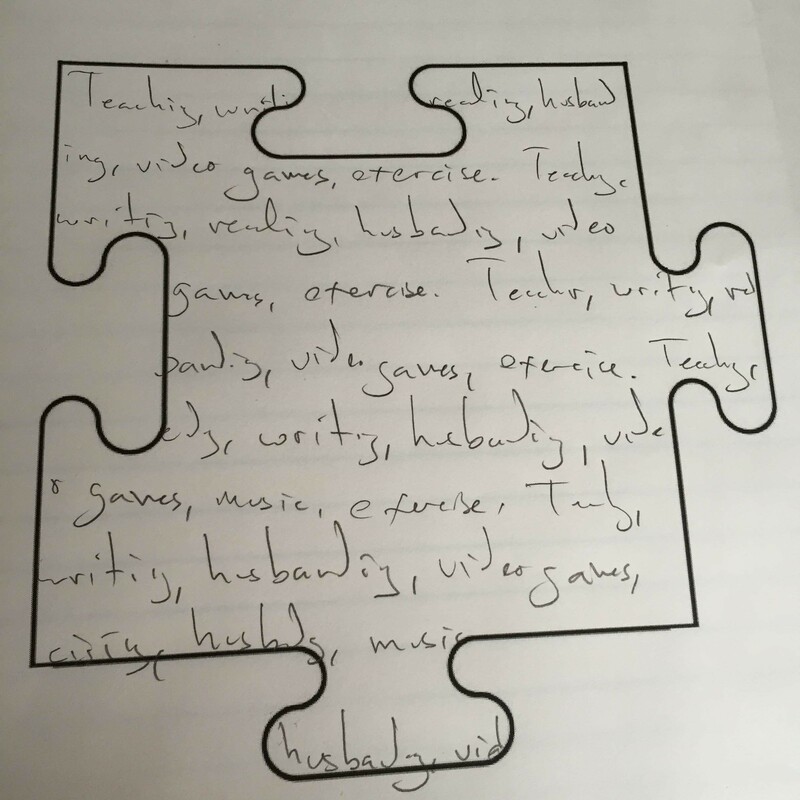 My puzzle piece is a The Shining-type exercise in repetition (All work and no play…). I need a life. We then walk around and share with our colleagues. She again cites brain-based research that says the brain is a social instrument, and that sociality promotes effective cognitive development. Many of us realize that we share hobbies and life experiences. So this type of activity fosters community for students who might be from warring countries. I’m also reminded of the recent article in The Atlantic about what information Americans should know (not Hirsch). She talks about Kinesthetic Grammar, a TPP (Total Physical Response) protocol. This involves linking most of her activities to corresponding body movements. Learning the word “stand”? I’m immediately reminded of my time at a charter school. Lots of chants and choral reading and highly regimented movements. She tells us about the Poetry Café, her first big assignment for the students. She scaffolds this to go line by line. So, step one, illustrate your favorite place. Step two: write down the following stems for your place. One stem per sticky note. I see ___, I hear ___, I smell ___, I touch ___, and I taste ___. Then, all of a sudden, we have a pretty decent poem draft. I must admit I spent all my time on the drawing. Whoops! She lastly has the kids create videos of themselves and their peers reading their poems using Animoto. The final result was heart-warming. I won’t post it, though, for privacy reasons. Gaby talks about how she has students stretch sentences using content vocabulary. 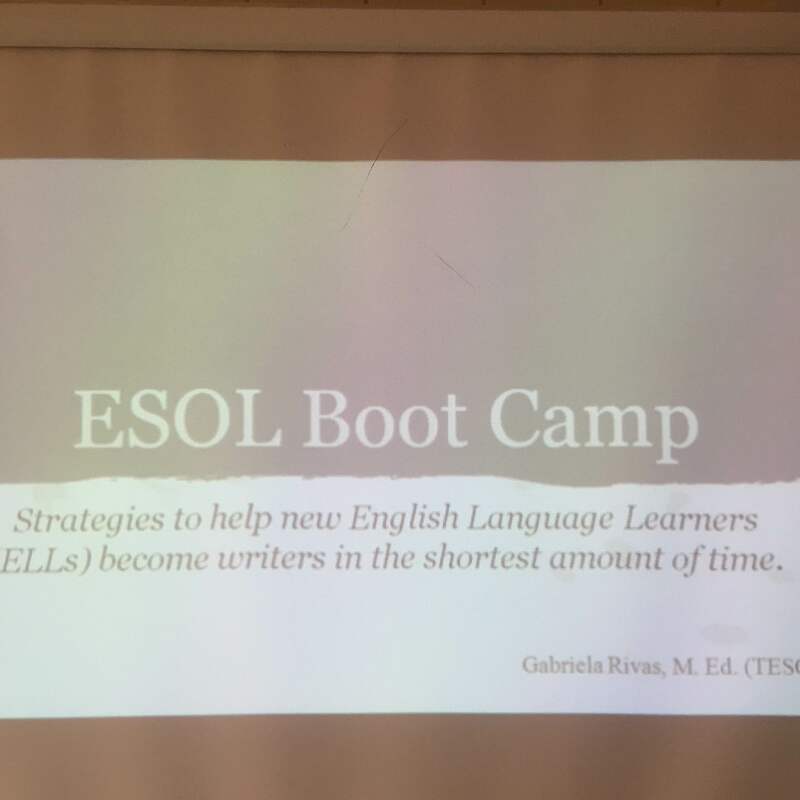 Since expectations have risen for ESOL students, Gaby does her best to include as many content areas as possible. Sentence frames to help show students what good, intro level writing looks like. Highly structured, sentence-by-sentence, on notecards. This is absolutely amazing. Such thoughtful, intentional use of strategies. I’m also feeling some pretty healthy cognitive dissonance. I stopped using most of these types of strategies and methods when I left the charter school environment. Are these techniques I need to begin using again? Using certain techniques with specific sets of students is something that I’ve come to be very wary of. Such a great commitment here, as well, to creating a safe classroom environment. Her presentation (using Google slides, btw) was one of the best I’ve seen.